10 Gems from the Iconic Bestselling Book by Dr Susan Jeffers on How To Turn Your Fear And Indecision into Confidence into Action. Is it some of the above? All of the above? Perhaps you could add a few more to the list. Never mind ….. Join the crowd! So said Dr. Susan Jeffers in her iconic book ‘Feel the Fear And Do It Anyway®️’ almost thirty years ago. I read that book then and it influenced me profoundly. It gave me the mindset, the insights and the tools to quite considerably improve my ability to overcome my fears and get on with life. The cynic in me questioned how effective it might be with an industrial strength fear. In 2014 I had occasion to really test the book. A routine cardiac MRI revealed a tumor on the right atrium of my heart. I was engulfed in fear and panic. I didn’t know how to respond or handle the situation. 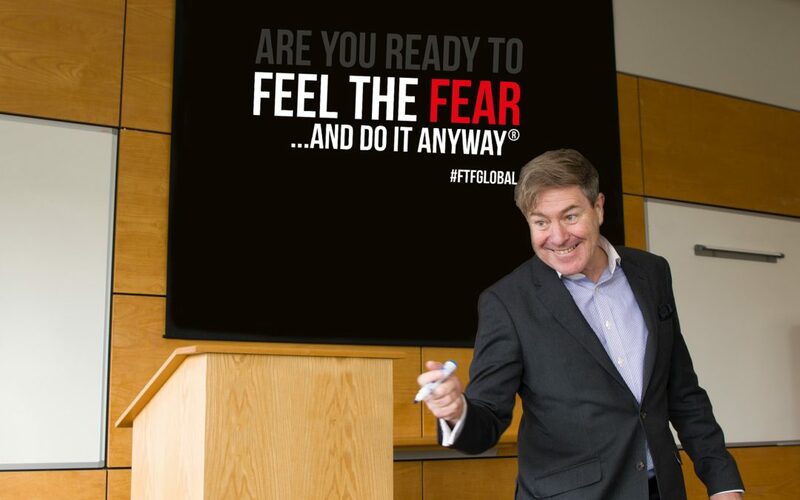 In desperation I dusted down my old copy of ‘Feel the Fear and Do It Anyway’ and for 18 months of fear and uncertainty, it became my best friend, mentor and guide. I vowed that if I ever regained my energy I’d teach others how to overcome their fear. Susan sadly had passed on but I succeeded in making contact with her husband and I have recently become a qualified trainer in the material. 1. Contrary to what you might think fear is less of a psychological problem and more of an educational issue. By learning to re-educate your mind that fear is a fact of life and can be handled can magically reshape your life. 3. There’s bad news for those expecting fear to vanish and go away because Dr. Jeffers reminds us that the truisms of fear are that they will never go away as long as you grow. In fact, the only way to eliminate your fear is to go out and do it anyway. And watch as this makes you feel better because in the final analysis, pushing through fear is less frightening than living with the underlying fear that comes from a feeling of helplessness. 4. The great entrepreneur and teacher, Pádraig Ó Céidigh, once counseled to ‘live life closer to the edge. That’s where the real learning and fulfillment resides.’ Dr Jeffers believed that also and taught the value of constantly expanding our comfort zones. But this takes persistence to reconditioning the negative thoughts of a lifetime. 5. Dr Jeffers controversially states that ‘ if you’re in a job you hate, if you’re single and you want to be married, if you’re in a lousy relationship and want to get out of it, if your daughter is making you gray before your time ………. you are also playing the role of victim.’ The trick is to take responsibility for your life, your results, your fears. This means neither blaming yourself or others but figuring out for once and for all what you want in life and taking the responsibility to go for it. 6. Positivity is infectious and contagious no matter what the naysayers say. And positivity, rather like bathing, needs to be done daily. Positivity and negativity are both habits. And habits can be changed. 7. One of the greatest fears that keeps us from moving forward is our difficulty in making decisions. We’ve been programmed from the youngest age to ‘beware we might make the wrong decision.’ And as such we fear that ‘this wrong decision will deprive us of something – money, friends, lovers, status or whatever the right decision is supposed to bring us.’ Imagine having a ‘No-Lose’ model or mindset! You can. 9. Become a giver, and give from a place of love rather than a place of expecting something in return. Wondering about what you can give! Try praise; information; time; and love. 10. Manage the two most influential voices in your head – your Chatterbox and your Higher-Self. Your Chatterbox is the incessant voice inside your head that heralds doom, gloom and losing. No wonder so many of us fear being alone by ourselves in silence preferring to drown out the Chatterbox with noise and distraction. Commit to replacing your Chatterbox with a loving and positive and powerful voice. And call it your Higher-Self. It’s not as loud as your Chatterbox but rest assured it’s your silent partner in success, fulfillment and peace of mind. Pádraic Ó Máille is an award winning speaker and best selling author who’s messages are inspirational, positive and up-lifting. Following a serious health scare he rediscovered the power of a book he’d read many years before called ‘Feel the Fear and Do It Anyway’®️ by Dr. Susan Jeffers. He resolved if he ever recovered his energy that he would help others to overcome their fears by presenting the book as an interactive workshop.